I took a long bike ride today, up to the north side of my city, St Louis. What I was looking for probably never really existed, but I was determined to find it anyway. I rode past Delmar Boulevard, commonly known as the Delmar Divide. It separates the mostly-unprosperous northern half of town from the mostly-prosperous southern half. My wife is going to kill me when she finds out I’m riding a bike past crack houses. Between dodging traffic, I’m looking for a house. A very specific house that held lots of cherished memories for thousands of people, including me. 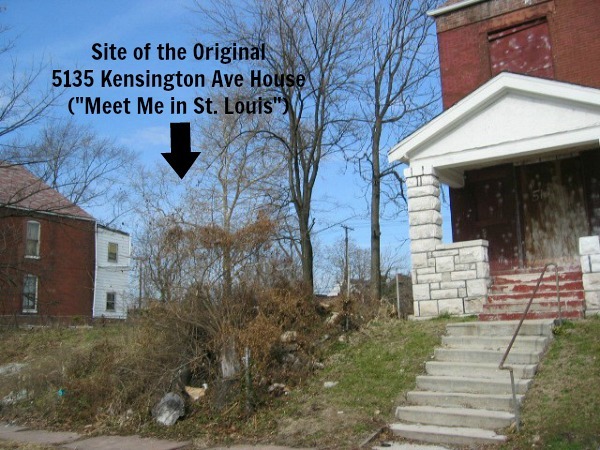 5135 Kensington Avenue was the address of Sally “Smith” Benson when she lived here in the early 1900s. She’d later write a series of short stories about her years spent in that house with her family. Those stories would serve as the foundation for the beloved 1944 MGM classic musical MEET ME IN ST LOUIS. The story in the movie is slight at best. The Smith family is happy in St Louis around the time of the 1904 World’s Fair, but the father accepts a position that would move them to New York City. In the proceedings, Judy Garland sings standards like “The Boy Next Door” and “Have Yourself a Merry Little Christmas”. At the end of the movie, Dad gives in and the family stays in their happy home. Except that’s not really what happened. In real life, the family actually did move to NYC, leaving behind their beloved house and hometown. Funny how harsh reality often pails in comparison to the way we remember things. The years and wishful thinking have a way of building the past up into something that was always a little too good to be true. I knew all this when I started my ride up here. It took a good 45 minutes to get from my house to Kensington Avenue, but still I wanted to see the street. I guess I was hoping there might be a little magic left up here somehow. Well, when I turn onto the street from Union, there’s no magic in sight. What I do see are some empty lots and condemned houses, next to others that look to be in great distress. Finally, I arrive at the address, 5135. Nothing, there’s nothing there. It’s an empty lot. The home had evidently been abandoned so long that by 1994 it was finally demolished. Deep sigh. The symbolism is not lost on me. That empty lot feels quite a bit like me right now. I’m empty. I’ve been working for a year now toward noble goals in my calling as a pastor here. We made some progress and have seen some good results. But despite everything, I’m feeling a bunch of nothing. I just feel empty. The empty lot at 5135 Kensington is a stark reminder to me of how homeless I feel. This is odd since in fact I’ve just purchased a home for my family. It was built around the same time period as the MEET ME IN ST LOUIS movie takes place. We’ve set up housekeeping in our golden-colored Victorian house and are finally homeowners once again. And yet after being here a year now, I still feel oddly displaced. You see, I left a lot of people I loved to get here. I know that’s just part of the ministry and nothing worth whining over. I left not only church members, but a community where I was valued outside my church. Now a year into things here, and I still haven’t managed to replace those friendships and diversions that made up my former life. I guess I’m looking for a home like the one on Kensington Avenue. A home with those warm amber gaslights they had in those days, and with a warmth on the inside to match. A place of belonging with connections to the community and people who’ll stand by you no matter what. A home so precious you don’t want to leave even if the lure of New York City beckons. In other words, a house that feels like home. So far, I’m instead finding traces of another musical, The Music Man. That’s the one where Harold Hill is welcomed to River City, Iowa by Midwesterners who dismissively sing to him, “You can eat your fill of all the food ya bring yourself!” In other words, detached tolerance. Truly, there are some sweet, warm people here. who’ve bent over backwards to welcome us. But it’s different from the south where I call home – Alabama, Tennessee, etc. There’s a gentleness there, at least present in the good churches I’ve served. I’m afraid the midwestern way is a bit more stern than what I’m used to. We’re starting to get our feelings hurt a bit, and I’m feeling the need to take up for my wife as well. I don’t think anyone means anything by what they’re doing – it’s just the way things are. But it doesn’t help when you’re already homesick and wondering how to fit in. 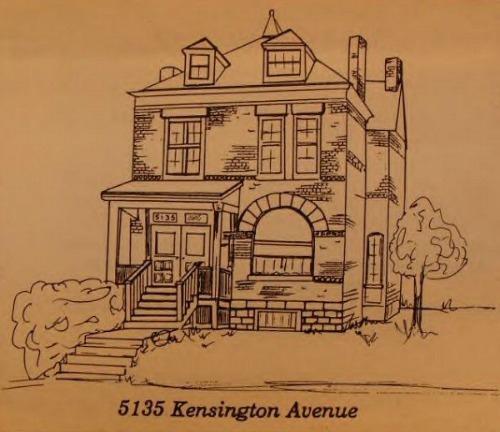 That house on Kensington Avenue, or the lack of it, reminds me of my church in many ways. Once a growing fellowship for over 1000, now it struggles to find its footing. The glory days are behind it now, waaaaaaay behind. And we’re all wondering if lightening can strike twice. Can I help the church spring back to life once more and stem a decline of more than 40 years? It’s hard enough to be a success the first time. But now after that dream has died and you’re looking at an empty space where it used to be, how do you restart the momentum? And unless I can help them recapture that warmth of 5135 Kensington Avenue, no one will want to call our church home. So three empty spaces are in front of my eyes right now. The empty lot where a magical musical house used to be. The somewhat-empty church where so many lives were changed once upon a time. The empty pastor who used to feel alive and loved. All three of us have seen better days. And all three are long shots for experiencing a revival anytime soon. Thankfully I know a God who specializes in long shots. He promised me in Haggai 2:9 that “the glory of the latter temple will be greater than the former”. I believe that’s true not only for my church, but also for me personally. In fact, He can use my desire for a welcoming home to help me create one here in St Louis for others. He’ll use that emptiness as a vacuum to draw people into our loving family. I’m praying that God is not finished with me yet. I’m asking for Him to show me what I’m supposed to do, and to give me strength in the midst of this homesickness. The street looks menacing as I finally ride back toward home. Cars drive by with people watching me, wondering what I’m doing there. Trust me, I wonder that too. Yet I still am holding on for that happy ending, the one from the movie that didn’t happen in real life. That’s because I serve a God with more magic than MGM could ever muster. He alone can make a home in the midst of this empty lot called my heart. He alone will make the latter days greater than the former. And He will once again turn on the warm, loving lights of home here in St Louis, hopefully now just a few streets south of Kensington Avenue.